December 5: Cookies in the oven. This sounds good, but in reality it was this…. The parchment paper slid right off the cookie sheet along with all my cookies. Hannah watched in horror; the reaction was something like this. 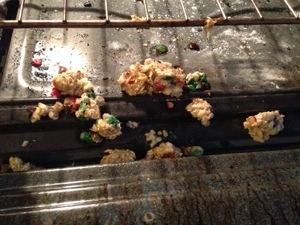 Cookie tragedy. Luckily, there were a couple left that we were able to eat. 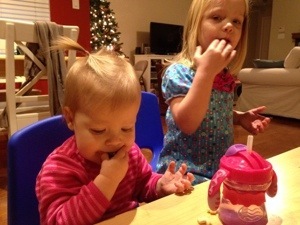 Very easy recipe we got at MOPS today: 2 mashed bananas, 1 cup oats and a few chocolate chips. Bake at 350 for 15 minutes. And yes, Hannah is wearing a short-sleeved nightgown in the middle of the afternoon when it’s almost freezing outside. If you currently have small children, you understand this. Oh no! So sad! I can understand why Hannah was bummed. 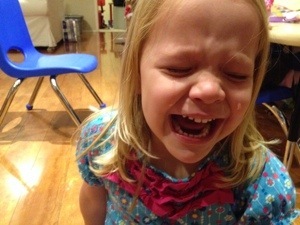 Destroyed cookies are apparently a source of great trauma. I understand!